Most hotels in town have windows overlooking the street (if you are lucky). But wouldn’t it be a treat to have your own terrace – not just a balcony? A place to sit down to sunbathe or sip a cup of coffee, read a book or plan your sightseeing for the next day. Somewhere with a few plants that kept you connected with nature in the middle of the busy city, or that offered some spectacular city view for you to enjoy. And what about your private pool or jacuzzi outdoors? That would be just luxury! But it’s not easy to find hotels offering such little gems, as what they often advertise as a terrace isn’t anything more than a tiny balcony… We made that research for you, and today we are sharing our best findings, hoping to help you planning the best vacation ever! The hotel Neri is located in the Gothic Quarter and near the Jewish Section, in a restored medieval building set in a quaint pedestrian area. It’s a perfect choice for those seeking silence and privacy: their deluxe rooms with private terrace are conceived to relax your mind and body. Their terrace is closed with a bamboo wall, what provides privacy and a sense of peace while you enjoy your morning coffee seating in a table, surrounded by a few plants that the hotel staff grows in the balcony for you. A Nespresso machine and a teapot will allow you to repeat the experience any time of the day. You have also access to the hotel rooftop terrace, that has a bar with hammocks and flower bushes that will make you think you are in the rain forest rather than in Barcelona. 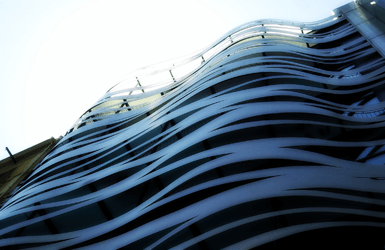 This elegant contemporary building was created by the Japanese architect Toyo Ito, who had been impressed by Gaudi’s La Pedrera when he first visited Barcelona during his honeymoon. Little he could think that he’d be asked to build a hotel accross the street from it years later! And he couldn’t resist the temptation to play with Gaudi’s organic wavy shapes to create a conversation between both buildings: the old and the modern. It’s one of the few hotels with balcony over the exclusive Passeig de Gràcia avenue (maybe the only one, as all the other I can think of have just windows overlooking the street). Make sure to book their Pedrera rooms ( Deluxe Pedrera View, Pedrera Penthouse and Superior Pedrera View), as the others only have windows to the inside of the block. The guests of the hotel have also access to a gym and two pools: one in the backyard and one in the rooftop terrace (which cas also spectacular views over the city). We are in love with this boutique bed & breakfast that occupies an old modernist apartment in Eixample, walking distance from Passeig de Gràcia, and is decorated to feel like you had been invited by an old Barcelona lady with exquisite taste to spend a few nights over. Their Mallorca room has access to a lovely private tiled patio where you’ll be able to sunbathe, or sip your morning orange juice under an umbrella, surrounded by green bushes that keep your privacy. Just like locals do! Their Provença rooms don’t have a terrace, but their balcony overlooking the street is big enough to fit a couple of folding chairs to let you enjoy the most popular traveler sport: people watching. Plus the location is wonderful as you are surrounded by fun shopping opportunities and restaurant options, and the area is super safe. Now can you imagine having a room with private terrace overlooking la Rambla AND a private jacuzzi pool? Yes, that’s possible at the 1898 if you book their Colonial Suite. Plus the terrace is actually 10 square meters (107 square feet) larger than the room itself, which isn’t precisely small. If you book this room, they’ll welcome you with a champagne bottle and gourmet sweets, to start your stay in Barcelona with the right mood. 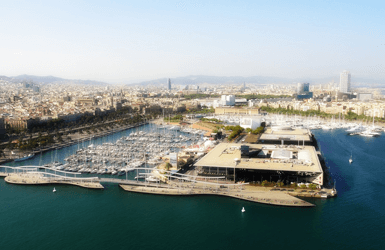 And of course, you have access to the beautiful spa in the brick-domed basement and the great rooftop bar overlooking la Rambla, the roof of the Betlem church and the Hill of Montjuic. All the suites and most of the Premium rooms of this hotel feature a spacious terrace overlooking the city and the Mediterranean sea, and most of the Deluxe rooms have one with views over the surrounding gardens. We love their gorgeous stand-up designer bathtubs, that are ideal for a perfect romantic getaway. Because it’s actually a great choice for a romantic trip: located in the Hill of Montjuic, it’s away from the hustle and bustle of the city and it’ll be tempting to just stay at the hotel enjoying time with your sweet heart rather than sightseeing under the hot summer sun. It just might not be a great choice if your plans are doing lots of sightseeing in the city, as you’ll end up tired of taking taxis to get back to the hotel. 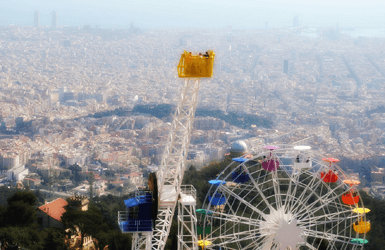 If the city views of the Miramar hotel were good, nothing beats the ones you get from Gran Hotel La Florida, located at the top of the Tibidabo Mountain. All the rooms have either large French windows or balconies over the city, and the Terrace Room and most suites (except the Presidential and the Duplex 602/604 have private terraces with hammocks. We love the Japanese suite with its Zen garden, Cocomat suite with the most comfortable and natural beds you’d dream of: Cocomat is an organic mattress company and their beds range €6000! Both suites and the one designed by Federico Crocella include a private outdoor jacuzzi in the terrace. NOTE: Same as the Miramar, long taxi rides are needed to get into town. So what about you? Head to the comments below and tells us: do you know of any other hotels with balcony in Barcelona worth adding to our top list?